Environmental health research—from studying the effects of inefficient household cookstoves to conditions created by climate change—can play an important role in setting the global policy agenda around sustainable development, according to leading environmental health experts. As the United Nations’ Millennium Development Goals (MDGs) approach their 2015 deadline, leaders are considering ways to build upon and expand the successes of the MDGs after 2015. In this podcast, Sir Andrew Haines discusses how the new set of strategies, goals, and indicators can simultaneously improve health and increase sustainability. Reducing global greenhouse gas emissions to slow climate change could prevent millions of premature deaths due to air pollution over the next century, according a new study. An interest in structural biology and an opportunity to work at an institute known for its career development opportunities brought Rajendrakumar Gosavi, Ph.D., to the NIEHS in Research Triangle Park, North Carolina. 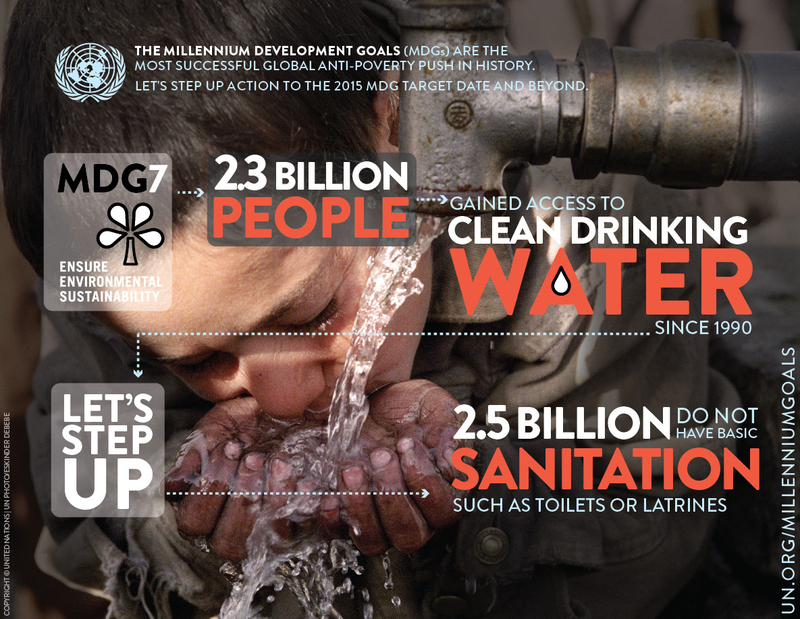 MDG 7 “Ensure Environmental Sustainability” included targets for drinking water and sanitation. More than 2 billion people gained access to safe drinking water since 1990, but more than 2.5 billion do not yet have access to sanitation. A new report from the World Bank explores the impacts of climate change on the cryosphere, and lays out actions to reduce the health effects of climate change. A historic new international convention to reduce emissions and releases of toxic mercury and to phase out many products that contain mercury. A new report from the UN Environmental Program outlines climate change research priorities to support policy maker decisions, systems and regions, and emerging topics. This unanimous declaration underscores the importance of energy issues for sustainable development and for the elaboration of the post-2015 development agenda. A new document from the Pan-American Health Organization (PAHO) that summarizes key points from the PAHO seminar series Towards Rio+20. The Journal of Veterinary Pathology launches a new section on Environmental Pathobiology.